Blue Sky BuildersSkywriters Garage BlogTips and TricksWhich Ice Melting Product Should You Use This Winter? Calcium Chloride – Calcium chloride is a commonly used and widely available ice melting product. Calcium chloride will melt ice in temperatures as cold as -25 degrees, and will do little damage to your driveway or sidewalk. Calcium chloride works quickly, so it is a great product for anyone needing to clear their driveway in a time crunch. Be careful when using calcium chloride near your grass or plants, as too much of the product can do damage to your lawn, flowers, and shrubbery. Calcium chloride is also an inexpensive solution, with 50 pound bags running between $10 to $20 each. Magnesium Chloride – Magnesium chloride is another frequently used ice melting product that has many benefits for homeowners. Magnesium chloride works in temperatures of -13 degrees and warmer, and is environmentally friendly, making it a favorite of gardeners. Like calcium chloride, magnesium chloride works quickly to remove your driveways ice, so it is great for the morning after extremely cold and icy nights. Magnesium chloride is also pet safe, so it is a great choice for pet owners. If your pet has kidney disease, however, steer clear of magnesium chloride, as it is lethal if ingested by pets with the disease. Magnesium chloride can also damage plants, so homeowners should avoid over applying the product in greener areas. In addition to damaging plants, using magnesium chloride can do damage to your driveway and sidewalks, so use caution. Bags of magnesium chloride typically run anywhere from $10 to $20. Potassium Chloride – Potassium chloride is very similar to magnesium chloride. Both are pet safe, and are easy on the environment, so they are favorites of pet owners and those with green thumbs. Potassium chloride is not as effective in colder temperatures, and should only be used in temperatures of 25 degrees or warmer. Potassium chloride is a great choice for pet owners living in warmer climates. Also, unlike magnesium chloride, potassium chloride will do little to damage your driveway and sidewalks. 50 pounds bags of the product tend to start at $20 each. Sodium Chloride (Rock Salt) - Sodium chloride is one of the cheaper ice melting products on the market, with 50 pound bags usually costing under $10. Sodium chloride works effectively in 20 degree temperatures and higher, so it is great for homeowners in warmer areas. While inexpensive, sodium chloride does have it’s drawbacks. It can easily damage concrete, brick, metal, asphalt, grass, plants, and any wood, like a front porch, deck, or garage siding. Sodium chloride is also very dangerous for pets, so cat and dog owners should probably avoid it. Urea/Carbonyl Diamide – Our last option is great for those looking to protect their driveway and sidewalks. Urea is pet friendly, environmentally safe, and does not harm concrete or asphalt. It is also one of the cheaper products, running usually at under $10 a bag, making it a great choice for bargain hunters with pets. The drawback to urea is that it is not as effective as other ice melting products, especially in colder temperatures. Urea works best in warmer temperatures, and loses it’s effectiveness when outside temperatures get to below 10 degrees. Once you have found an ice melting product to fit your needs, you need to know how to apply it properly. First, be sure to remove any snow from your driveway and sidewalks. 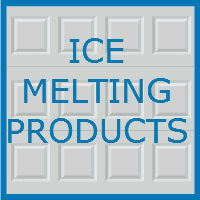 Ice melting products only work effectively if they are able to target ice, not layers of snow. Once all the snow has been removed, use gloves or a spreader to spread the product evenly on all desired surfaces. All ice melting products should have directions on the bag, so be sure to follow them closely. The directions will indicate how much of the product to use, and warn users of any surfaces the product could potentially damage. When storing, be sure to keep your product away from pets and children, even if the product is labeled pet safe. Also, remember to wipe pets paws off as they come back from playing outside or taking a walk. While you may use pet safe products on your property, your neighbors may not, and your pet could potentially lick their paws and ingest dangerous chemicals. Experts say to call poison control immediately if any dangerous product is ingested by a pet or child. For more useful garage tips, and all other things garage related, be sure to follow our Sky Writers garage blog. We’ll keep you up to date on the latest and greatest garage ideas, and provide helpful tips for your next DIY project. Contact Blue Sky Builders online or at 630-852-8485 to speak to a garage expert about your next project.